With today’s technology, we can 3-D-print sculptures, mechanical parts, prosthetics, even guns and food. But a team of University of Utah biomedical engineers have developed a method to 3-D-print cells to produce human tissue such as ligaments and tendons, a process that will greatly improve a patient’s recovery. A person with a badly damaged ligament, tendon or ruptured disc could simply have new replacement tissue printed and ultimately implanted in the damaged area, according to a new paper published in the Journal of Tissue Engineering, Part C: Methods. PHOTO CREDIT: Dan Hixson/University of Utah College of Engineering. University of Utah biomedical engineering assistant professor Robby Bowles and his team have developed a method to 3-D-print cells to produce human tissue such as ligaments and tendons to greatly improve a patient’s recovery. A person with a badly damaged ligament, tendon, or ruptured disc could simply have new replacement tissue printed and ultimately implanted in the damaged area. The 3-D-printing method involves taking stem cells from the patient’s own body fat and printing them on a layer of hydrogel to form a tendon or ligament which would later grow in vitro in a culture before being implanted. “It will allow patients to receive replacement tissues without additional surgeries and without having to harvest tissue from other sites, which has its own source of problems,” says University of Utah biomedical engineering assistant professor Robby Bowles, who co-authored the paper along with former U biomedical engineering master’s student, David Ede. The 3-D-printing method, which took two years to research, involves taking stem cells from the patient’s own body fat and printing them on a layer of hydrogel to form a tendon or ligament which would later grow in vitro in a culture before being implanted. But it’s an extremely complicated process because that kind of connective tissue is made up of different cells in complex patterns. For example, cells that make up the tendon or ligament must then gradually shift to bone cells so the tissue can attach to the bone. PHOTO CREDIT: Robby Bowles/University of Utah College of Engineering. 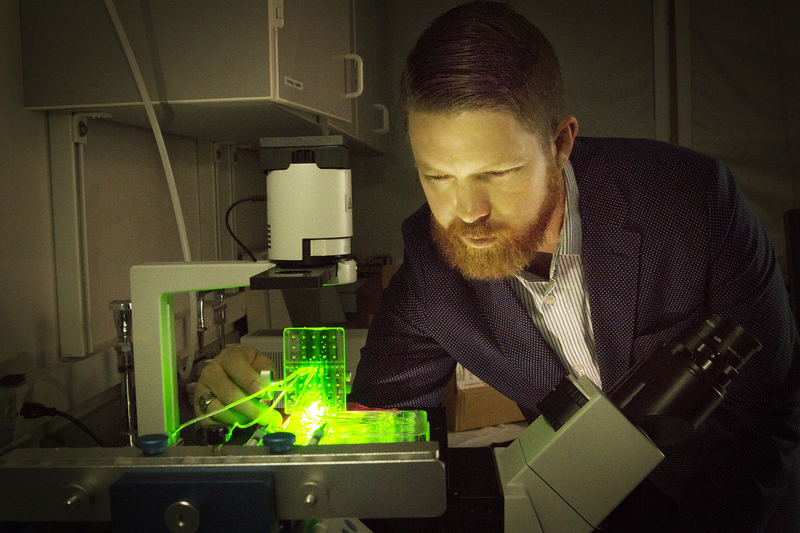 University of Utah biomedical engineering assistant professor Robby Bowles and his team have developed a method to 3-D-print cells to produce human tissue such as ligaments and tendons to greatly improve a patient’s recovery. 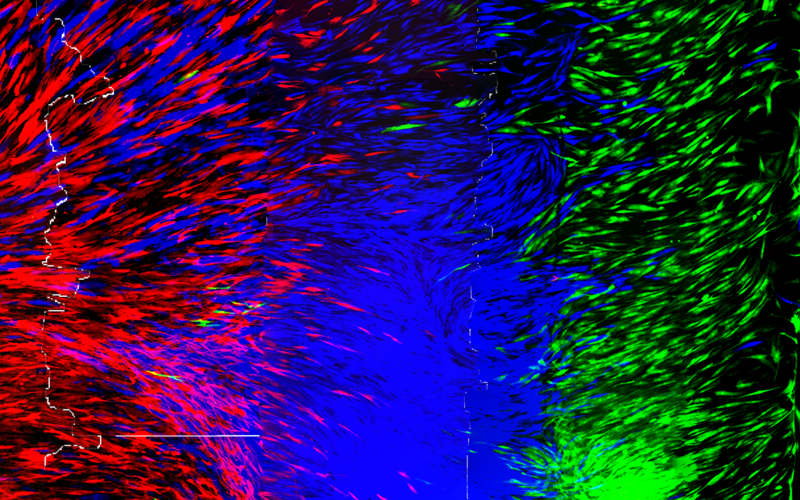 This image of cells that were made fluorescent shows how they are printed in complex structures for the purpose of producing tissue such as tendons and ligaments. To do that, Bowles and his team worked with Salt Lake City-based company, Carterra, Inc., which develops microfluidic devices for medicine. Researchers used a 3-D printer from Carterra typically used to print antibodies for cancer screening applications. But Bowles’ team developed a special printhead for the printer that can lay down human cells in the controlled manner they require. To prove the concept, the team printed out genetically-modified cells that glow a fluorescent color so they can visualize the final product. Currently, replacement tissue for patients can be harvested from another part of the patient’s body or sometimes from a cadaver, but it may be of poor quality. Spinal discs are complicated structures with bony interfaces that must be recreated to be successfully transplanted. This 3-D-printing technique can solve those problems. Bowles, who specializes in musculoskeletal research, said the technology currently is designed for creating ligaments, tendons and spinal discs, but “it literally could be used for any type of tissue engineering application,” he says. It also could be applied to the 3-D printing of whole organs, an idea researchers have been studying for years. Bowles also says the technology in the printhead could be adapted for any kind of 3-D printer.